It not about pacific to Suzuki swift, but to all car users that need to know at least some of the basic warning lights pop up in to your dashboard, according to statistics 40 percent user of a car globally don’t know about all basic warning lights symbols and meanings or simply let it ignore all lights flash on their car, which might lead a severe damage to a car in case of engine malfunction or else. Car drivers must have to know the meaning of the lights in order to tackle the situation properly and prevent measures that could save a car from damage and time as well. 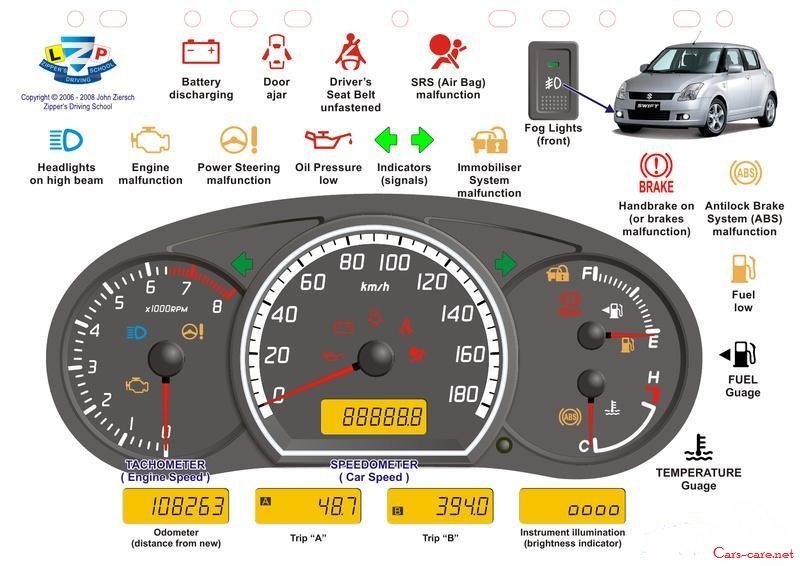 However in this topic the Suzuki swift dashboard warning lights and all front features symbols and their function are in detail in the form of chart for the audience to make it more easy and precise. Swift available in many countries particularly very popular in Asian countries like India, Thailand, Malaysia, Sri Lanka, Pakistan and many others in which the rate of not knowing anything about car basic warning lights and symbols are very high. Therefore to let it easy for the people to understand each symbol meaning and the cause of the light are in this chart, just go through from this chart, it can make a big difference while on a drive. Above chart are the common warning lights and symbols meanings, however the dashboard lights are more than the listed ones on a chart in a car in case of full option, but that symbols wouldn’t let in a dangerous position. If anyone wants to know further about other symbols meaning and their purpose then there is a an article about Nissan Warning lights which has a complete detail of each warning light function and how to tackle situation in case of road trip without any help. A little knowledge of basic dashboard lights can make a huge difference.